← Intra League Final 2012: Bad Apples are the Champions! 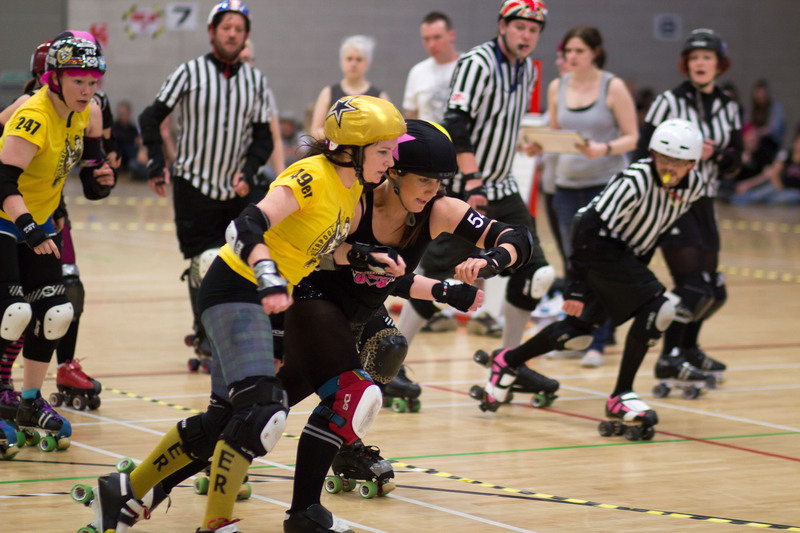 The last bout of CCR’s season saw the Slays and the Ragers take victory in both of their games, with strong resistance from Liverpool and Evolution. The first game between Ragers and Evolution was the Shrewsbury league’s first public bout, not that you could tell by their form on track. Both sides had strong walls and tactical nous, yet CCR led throughout the game using the tactic I like to call ‘ the thing!! !’ to their advantage. Evolution retaliated with strong defence when CCR’s jammer ploughed into their walls, but they lagged behind score-wise as they suffered from a spate of penalties throughout the game. The bout ended with CCR Ragers winning with 408 and Evolution finishing at 108, after a spirited and skilful performance from both sides. 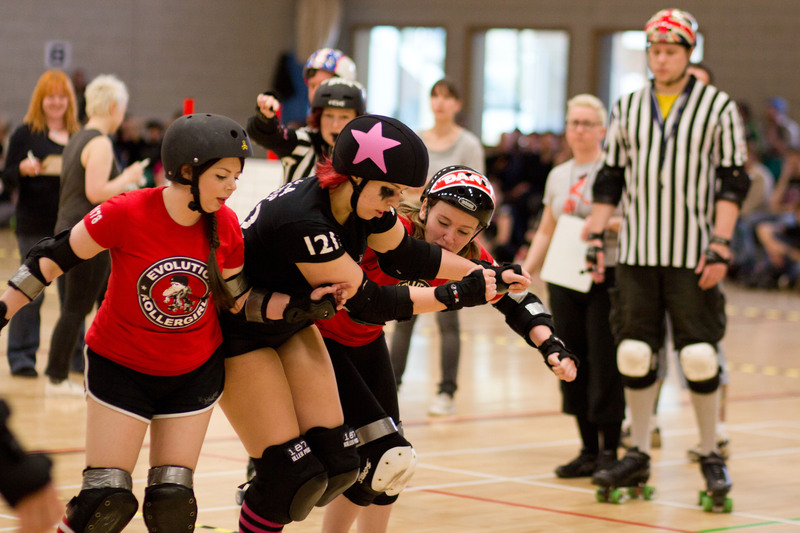 The second bout between CCR’s Slays and Liverpool roller birds was a hard- fought battle between the two sides. LRB scored 3 in the first jam but CCR got 30 points after ccr’s jammer had a most excellent powerjam. LRB’s blockers, hit impressively hard, bridged, and then kept hitting CCR’s jammer but suffered penalties. With the score 55-8 to CCR, the home team kept the pack fast and refused to give points away, with LRB suffering more penalties. LRB then got lead jammer, and she sneaked through the inside to gain three points, taking it up to CCR 55-12 LRB. LRB’s jammer dealt with a fast pack by placing her blocker in a CCR wall and pushing off her to score two points. CCR then got lead then LRB and one thing remained the same – fast packs- and half time saw CCR lead with 91-24- Exciting stuff yes? The second half saw some lovely offensive work from CCR’s blockers, who helped their jammer hit it and quit it and gain 103 -24 with 26 minutes to go. Another powerjam saw CCR go up to 125 after their jammer clocked up an awesome 22 point jam. LRB gained during their next two powerjams before their jammer was sent the box and CCR took points back with the score increasing to 203-58. Liverpool never gave up, giving hard hits to CCR and staying focused in the face of CCR’s savvy use of ‘the thing!! !’ when LRB’s jammer was in the box. The last few jams were fast and furious – with CCR’s blockers doing some cracking offensive work and Liverpool making use of a powerjam which took them up to 81 to CCR’s 234. After a final drama – filled jam, with players from LRB flocking to the box, the final score was 275 – 86 to the Slays. This entry was posted in Reports and tagged ccr, evolution rollergirls, Liverpool roller birds, roller derby. Bookmark the permalink.